Having your air conditioner break down can be inconvenient and make you miserable, especially if you drive much during hotter months. While it may be tempting to take the car into the shop for repair, you can fix some of the problems and save money in the process. Here is some car air conditioner troubleshooting tips to determine whether you or a mechanic should do the car air conditioner repair. 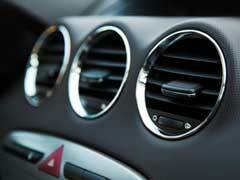 The first car air conditioner troubleshooting tip is you’ll want to know when it blows out warm air. Does it only do it every so often? Does it happen all the time? Knowing when can help you determine why the unit is not working properly. Here are a few examples. Your car may blow cold air initially, but over the course of the drive, it blows only warm air. There could be several reasons for this. One, many cars have a built in safety feature that will shut off the car air conditioner compressor if the engine overheats. Therefore, check your temperature gauges to see if it’s only blowing hot air when the car is running hot. If this is the case, it’s best to take to a mechanic to fix it. Another reason why it may switch to warm air is you have a frozen expansion pipe. This means the air conditioner refrigerant will not move through the line properly. This happens when there’s a leak and moisture seeps into the line. To rectify, take it to a mechanic where they will locate the leak and fix the frozen line by mixing in some refrigerant. Another car air conditioner troubleshooting tip is to see if there are any puddles under your car. If your unit blows warm air all the time it may be as simple as refilling the Freon. This is a simple step to do, as all you need is the refill kit. Before beginning, it’s a good idea to inspect the components for leaks, if you locate any seal them before refilling. These car air conditioner troubleshooting tips can help you diagnose and correct many of the problems the unit may have. If you are familiar with your car and are adept at working on it, you can fix many of these problems. However, if you lack experience and are uncomfortable, it is best to find a reputable mechanic to fix this for you.